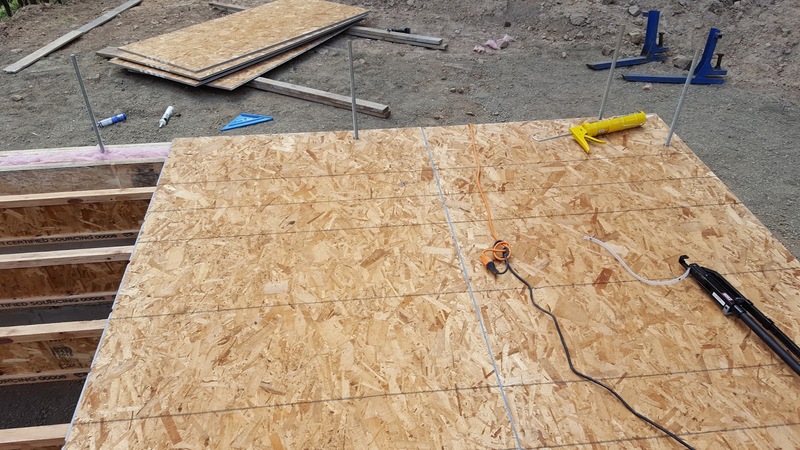 Tongue and groove OSB subflooring material goes down over floor joists. 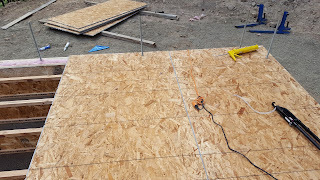 It's now nearing the end of spring and I'm still working on the downstairs flooring -- regretting taking a single day off for hiking, trips, or anything away from construction earlier this season. Friends to the rescue. Curt, Cyrus and Henryk helped me get the floor joists in and subfloor on. We made some mistakes, but nothing fatal. For example we got going and laid sheets on both sides of an open space, then had to slide the T&G sheet into the space, when we could have avoided it by laying sheets from one side to the other, like tile. A big, big help was our Senco "scruzzi" -- a submachine gun for screws. Senco screw gun for subfloor. DS440AC. 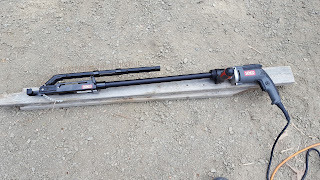 With this tool I can stand upright, walk along the chalk line, and insert screws at the rate of about 1 every 2-3 seconds. 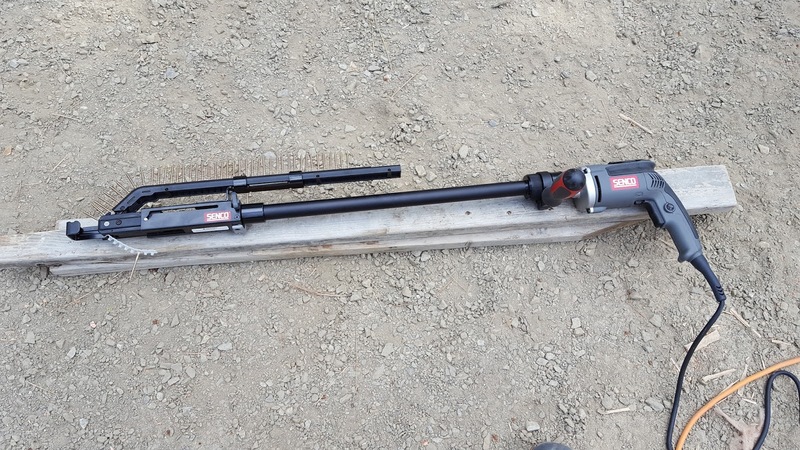 Two things slowed us down, besides refilling the magazine with a new strip of screws: (1) when I press and then try to reposition the head, a screw can get jammed in the holder; (2) when a screw is going in at an angle, the square drive can disengage and leave a tombstone screw. The jams were time consuming. The incompletely driven screws are easy to fix by someone following me with a hand drill. The wall thru-bolts also created some extra work. 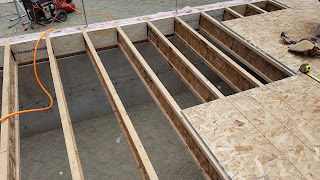 We bored holes in the subfloor sheets and lowered them down over the bolts. Measuring correctly was the worst of it. The T&G generally went in without a problem because we could angle the sheet as it went down. Corner of floor showing thru bolts (threaded rod embedded in concrete below). Naturally the work went faster once we got the hang of it, then slowed down a lot when we got to the more complicated piece around the patio slab, including the crawlspace access opening. Overall it was fast work and very satisfying. After a long time of jumping in and out of a crawlspace, now we had a floor to walk on! The building seemed suddenly smaller.